The mission statement of the Memorial is “...May this Memorial offer comfort, peace, hope and serenity.” It succeeded admirably for us. 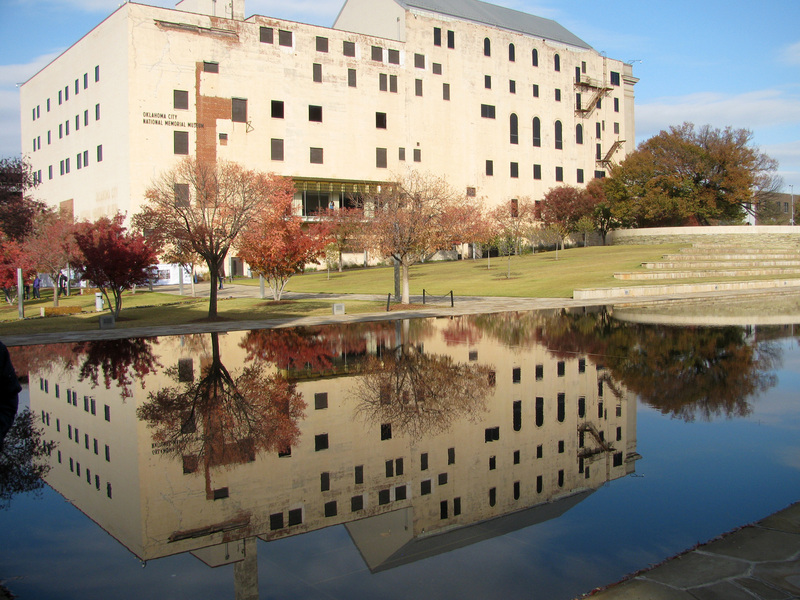 At 9:02am on April 19, 1995, the Alfred P. Murrah Federal Building in Oklahoma City was destroyed in the largest terrorist attack in US history up until that time. One hundred and sixty eight people died, and thousands of others were affected in countless ways. 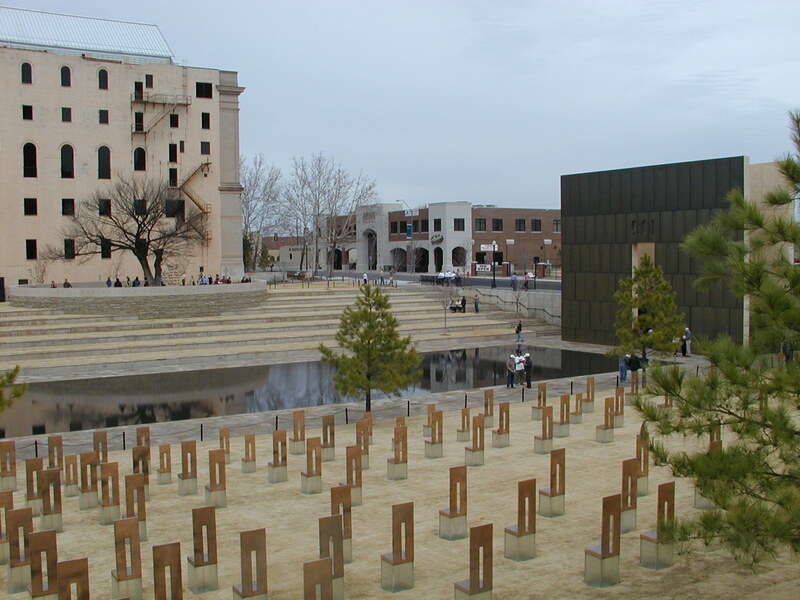 A couple of months ago, we re-visited the Oklahoma City National Memorial, dedicated on April 19, 2000, the five-year anniversary of the attack. I knew it was a highly significant memorial, but I wasn’t expecting to be as moved as I was on our first visit years ago. Significantly, we were still very moved on this recent visit. In these troubled times, especially in the aftermath of 9/11 and other more recent horrific shooting sprees, and bombings, a visit to a memorial such as this serves to remind us of the suffering of individual people regardless of where the troubles occur, and of people’s amazing ability to rebuild, to heal, and to make meaning out of tragedy. 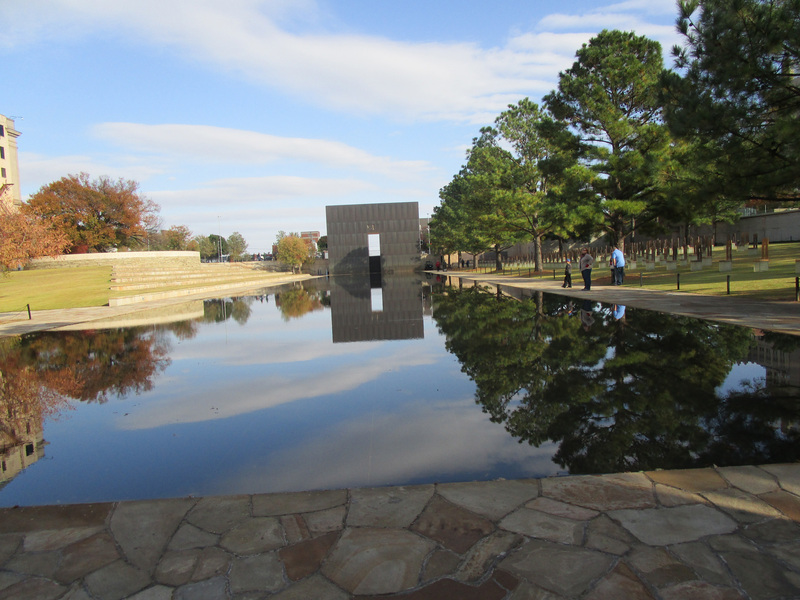 We wandered around the outside Memorial first to see the site and setting for this tragedy. What draws one’s eyes immediately is the chain-link fence along the edge. From afar it’s a blur of colors and shapes, but as you get closer the details emerge—a teddy bear with a picture below, a sock, a T-shirt, a card, flowers, a flag. 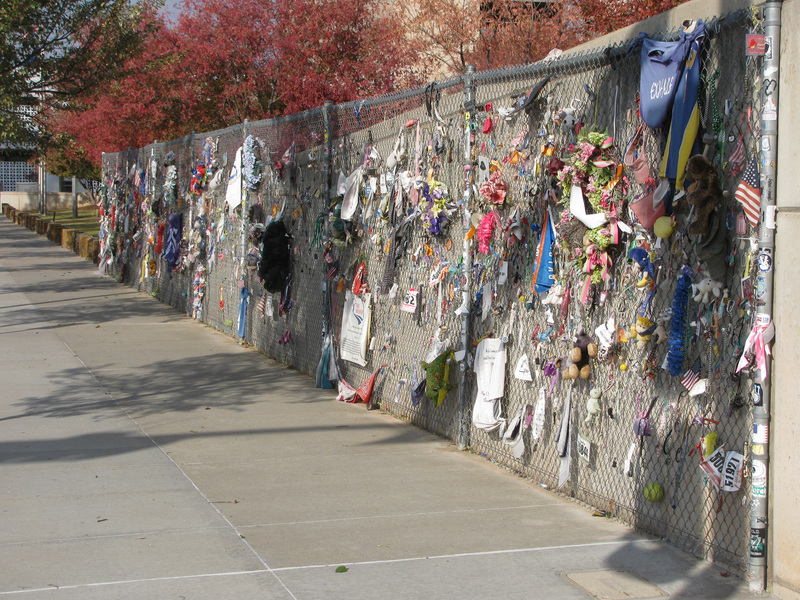 The fence is covered with these kinds of items, so touching, so personal, giving tragedy a face. People are still bringing things, all these years later. 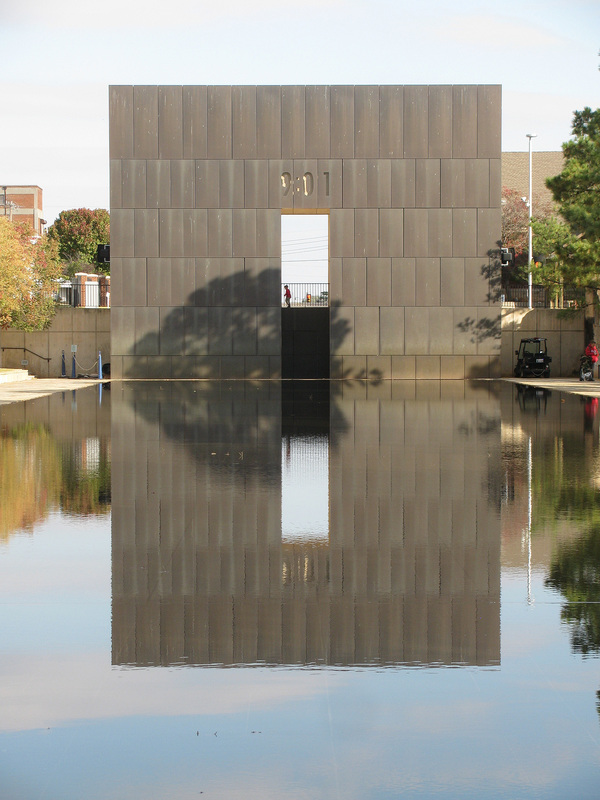 The huge Gates of Time, framing the moment of destruction (one inscribed with 9:01am, the moment before the destruction; the other with 9:03 am, the moment after the destruction), are at each end of the Reflecting Pool, which has replaced the street where the bomb went off. These Gates of Time illustrate so clearly just how quickly a tragedy can happen, how quickly lives can be lost and changed forever. 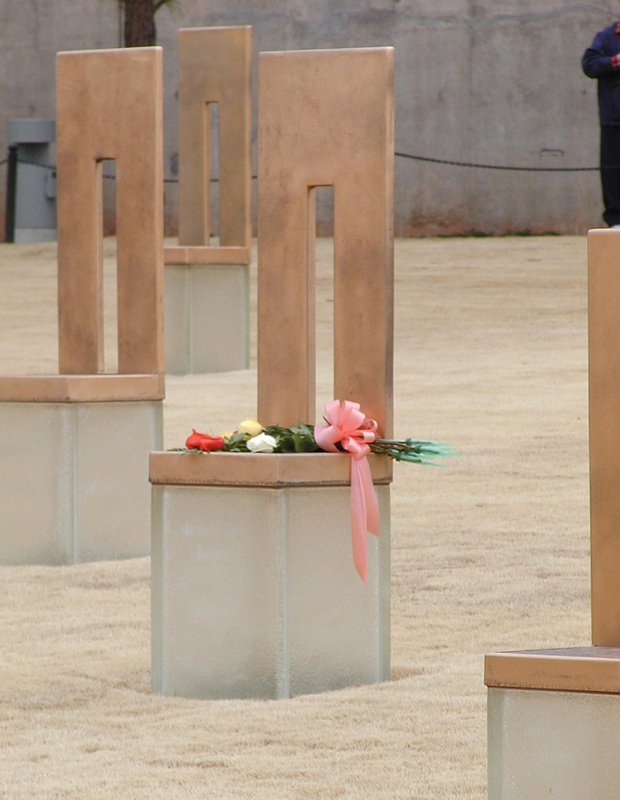 The highlight is the Field of Empty Chairs, in the green grassy area that was the site of the Murrah Building. There are 168 chairs, one for each life lost, including 19 smaller chairs for the children. The chairs are made of bronze and stone, each glass base etched with the name of a victim, and individually illuminated at night. A park ranger told a poignant story of how the final chair design was chosen. Apparently many people liked the chair concept, perhaps because so many of the victims were office workers who frequently sat on chairs. The adults at the meeting wanted to discuss this further, but a 10-year-old boy stood up and said that he didn’t care what the other people said. He liked the chairs, because any time he missed his dead mother he could go and sit on her chair and it would be like her lap and he could remember her. 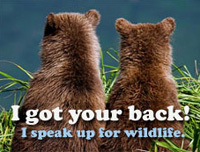 Who could resist such a touching statement? Another high point is the Survivor Tree, a large American elm that was badly damaged by the blast but, with lots of care, has survived. It is a symbol of resilience, both of Nature and of humans. We found the circular promontory around it a good place to sit and contemplate the whole Memorial. 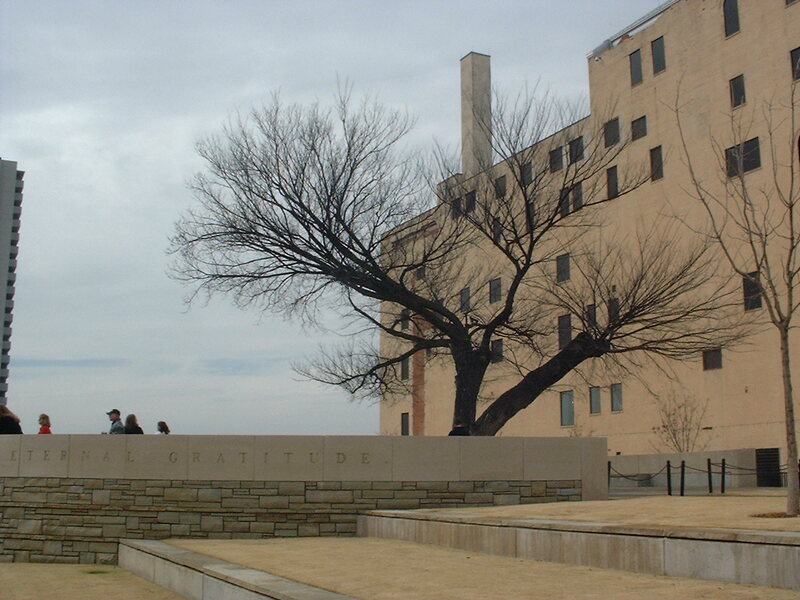 The Oklahoma National Memorial Museum in the former Journal Record Building, also badly damaged by the bombing, has interactive exhibits on two floors. It takes you on a chronological self-guided tour of the story of the bombing and its after effects, divided into ten chapters. Many graphic and moving pictures, video clips and interviews, and artifacts rescued from the blasted building, combine to give a very personalized and poignant experience. We were stunned and shocked all over again. I felt as though these atrocities had been done to me too. In my opinion, the Gallery of Honor is the most touching room in the exhibit. Around the edge of this circular room are photographs of each victim. Many also have items selected by the families, such as watches, medals and awards, wedding or other pictures. The most heart-breaking are the toys with the photographs of some of the children. The Museum is open 9am-6pm Mon-Sat and noon-6pm on Sunday. Adults $12; seniors, military and students $10; children under 5 free. 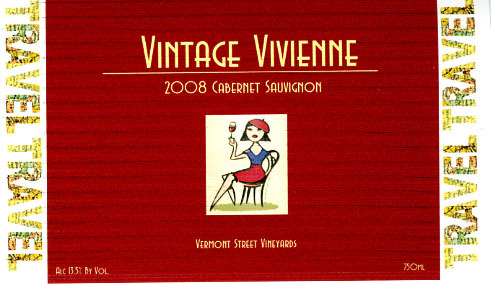 The web site is excellent and has much information.